Welcome to Vintage Powder Room Cinema! 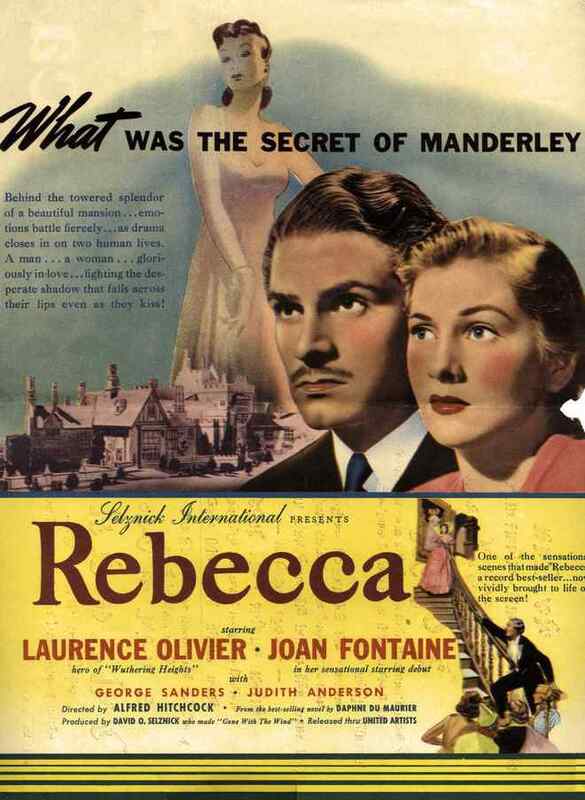 This week’s feature is THE LADY VANISHES, directed by Alfred Hitchcock and starring Margaret Lockwood, Michael Redgrave, Paul Lukas, Dame May Whitty. This is one of my favorites! Enjoy the movie. Aboard a train bound for London, Miss Froy, an elderly English governess, makes the acquaintance of young Iris Henderson. 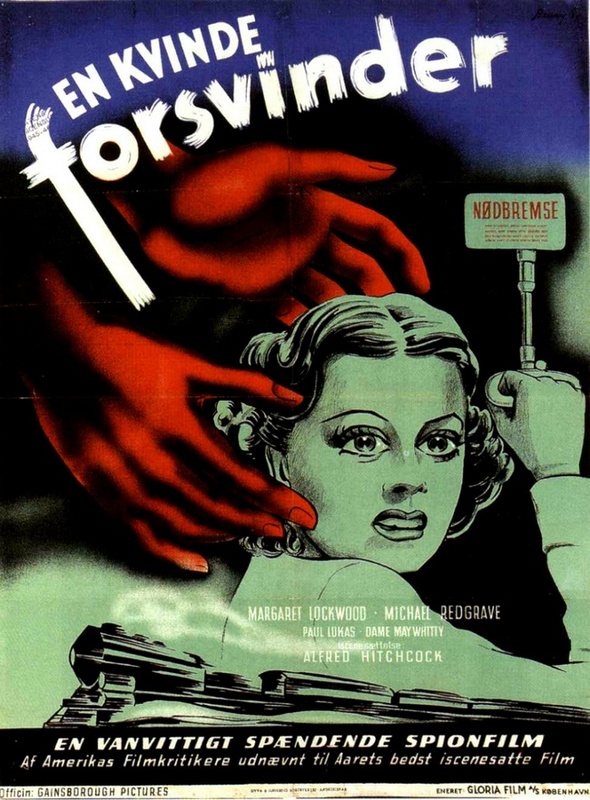 When Miss Froy disappears, Iris asks for the other passengers’ assistance in finding the old woman, only to have all contend that Miss Froy was never on the train. The Avon lipstick sample card was a lucky find at a flea market, and it was a bargain at $15, because it’s in wonderful condition with the miniature lipstick still attached. Judging from the woman’s hairstyle and makeup, I’d say it was manufactured during the ’30s. By then, Avon had been in business for nearly half a century, and had a fascinating history. It began as the California Perfume Company founded by native New Yorker David Hall McConnell in the early 1890s. McConnell started his career selling books door-to-door, but he found it tough to make a decent living. He decided to offer his female customers free homemade perfume as an incentive. Over time, McConnell realized the women were more interested in the perfume than in the books, and thus his life-changing epiphany: If door-to-door sales worked for books, why not for perfume? It was an inspired concept, and it changed the lives of scores of women who, instead of toiling 12 hours a day in a gritty factory or working as a domestic, could now become sales representatives for the California Perfume Company and make a living wage. Shopping from home was also a boon to women who were raising families and otherwise housebound. 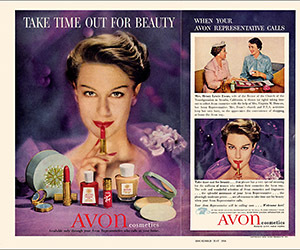 The company changed its name to Avon in 1939, and its success continued, even during World War II. The post-war era found Americans trading their lives in cramped, big-city apartments for the green lawns, multi-car garages, and BBQs of the new bedroom communities that were springing up around every metropolis—and Avon followed them. Vintage Avon ad. Source unknown. Whenever I hold the Avon sample card I can’t help singing the jingle and reflecting on the ways in which life has changed since the era of “the Avon Lady.” Internet shopping has replaced door-to-door salespeople, and we have traded the opportunity to bond with a friend over a cup of coffee and the perfect red lipstick for a convenient point-and-click purchase from a laptop. Change is inevitable, and I have bought plenty of cosmetics online myself, but I would love to travel back in time and spend just one afternoon trying on lipstick in the company of a friendly Avon saleswoman.